We followed this year’s Brit Awards from start to finish. The following insights are based on the capture of conversation throughout the duration of last night’s Brits show. The event exploded on social media, with the hashtag #Brits2016 tweeted more than one million times over the course of the evening. 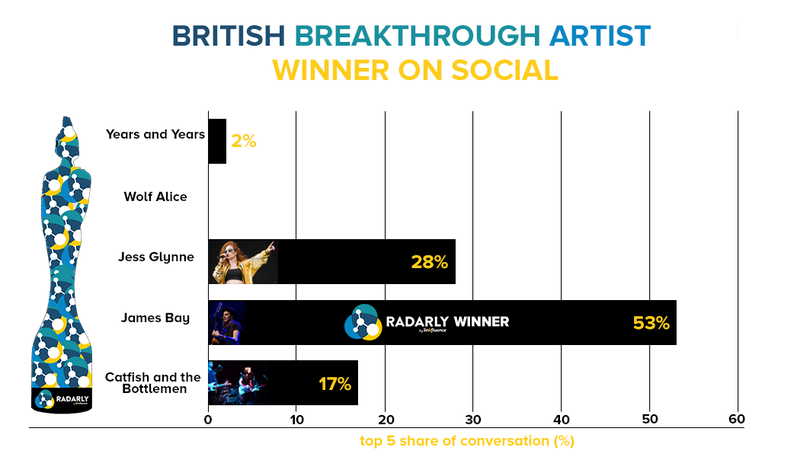 The Brits ignited further discussion by hosting their own Twitter campaign, #SocialVote. Twitter was used as a platform to vote for the ‘British Artist Video of the Year Award’. Votes were defined by the number of campaign specific hashtags, for example #britvidartistname. One Direction won the award for this category, ahead of multi-brit winner Adele. 15 minutes into the programme, ‘Louis and Liam’ (64,000 tweets) and ‘Harry and Niall’ (11,000 tweets) were already trending on Twitter - indicating a high engagement rate of the 1D community. The socially active Directioners ultimately led to the band winning the award. The Radarly Winner for British breakthrough artist is… James Bay! The artist began trending on Twitter just 20 minutes into the show, with over 18,000 mentions. Particular attention was paid to his part in Justin Bieber’s ‘love yourself’ performance. Less than 1% of conversation included mentions of Wolf Alice. The Radarly Winner for International female solo artist is… Ariana Grande! Ariana Grande stole the social show, mentioned in 53% of posts. 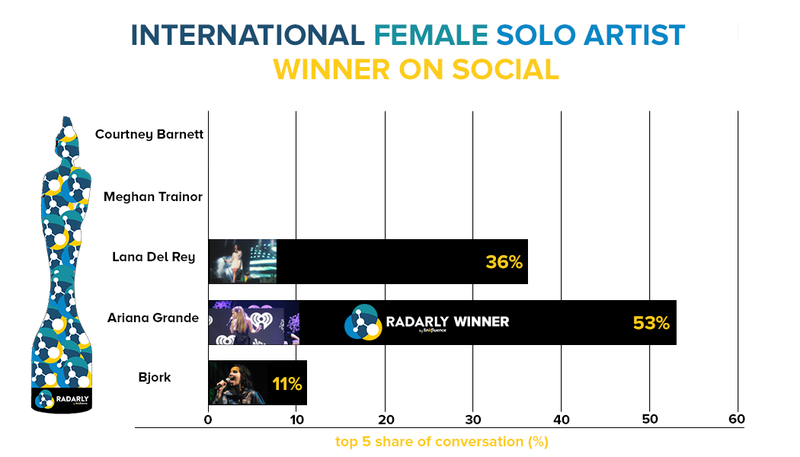 Courtney Barnett and Meghan Trainor featured in less than 1% of social conversation. 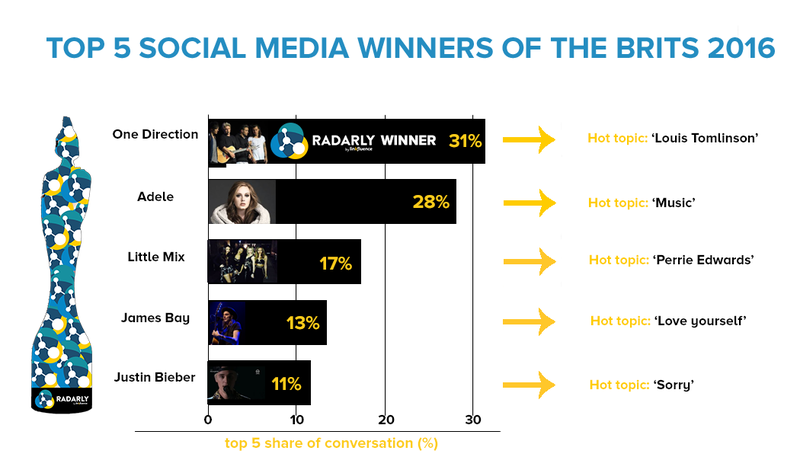 The Radarly Social Media Winner is… One Direction! One Direction were the most discussed artist on social throughout the Brit awards, with Louis Tomlinson taking the spotlight, sorry Liam! A close second was Adele. Despite winning on the night, she was the first runner up on social. Less than 2% of users addressed her swearing/bleep incident within Brit discussion. 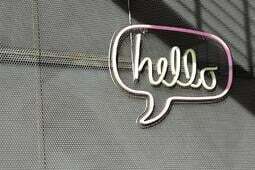 More interesting to the online community was Rihanna. 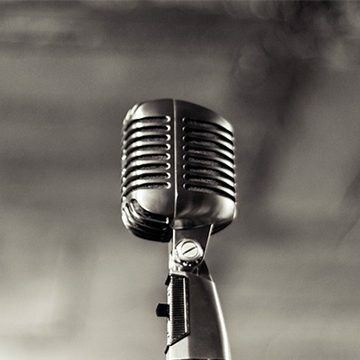 Although the singer was not nominated for an award, her sensual performance caused an eruption of conversation on social. The event was a great comeback for the star who has been off the scenes, with a massive reaction online (96% positive). Conversation surrounding Rihanna (56.6m twitter followers) almost matched the volume of conversation around International Male Solo artist of 2016, Justin Bieber (76.1m twitter followers). 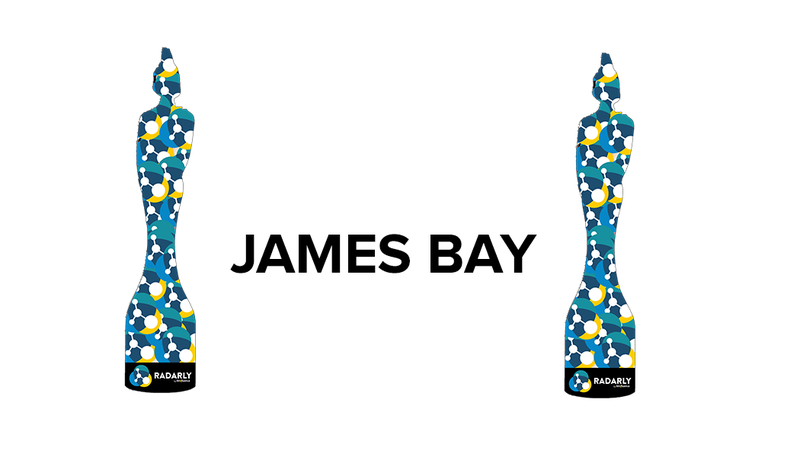 In 24 hours, James Bay gained 8,000 followers on twitter, in light of the awards. The other acts that performed at the ceremony gained an average of just 3,000 followers each - which is less than half of the British Male Solo Artist of 2016. 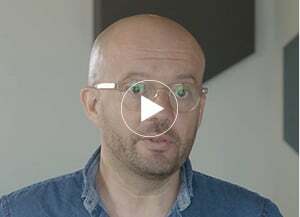 Social media connects big events and big names to consumers. It is a two-way operation: the consumer influences the event and the event influences the consumer. 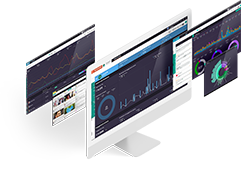 Radarly gives brands the power to listen to their consumers, providing them with insights to feed their consumer’s needs. 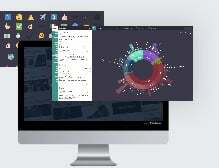 To learn more about Radarly, get in touch!